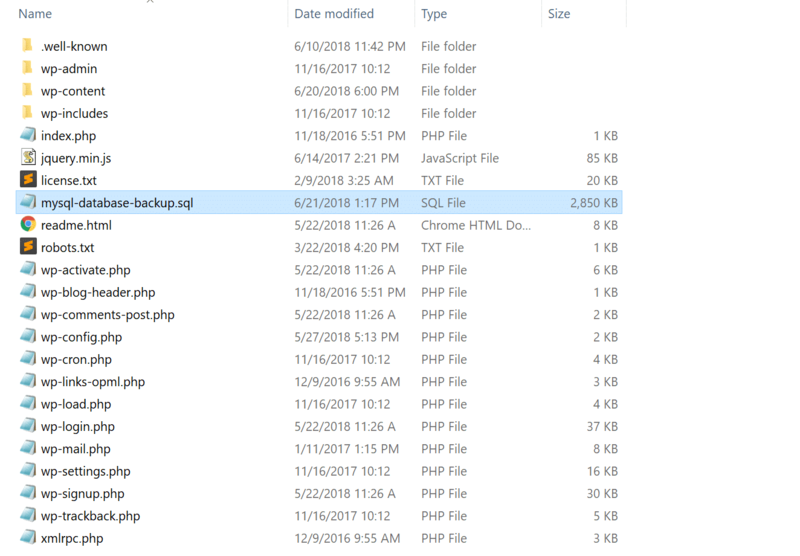 How Do WordPress Backups Work? We provide daily automatic WordPress backups, as well as system generated backups for all sites on your account. 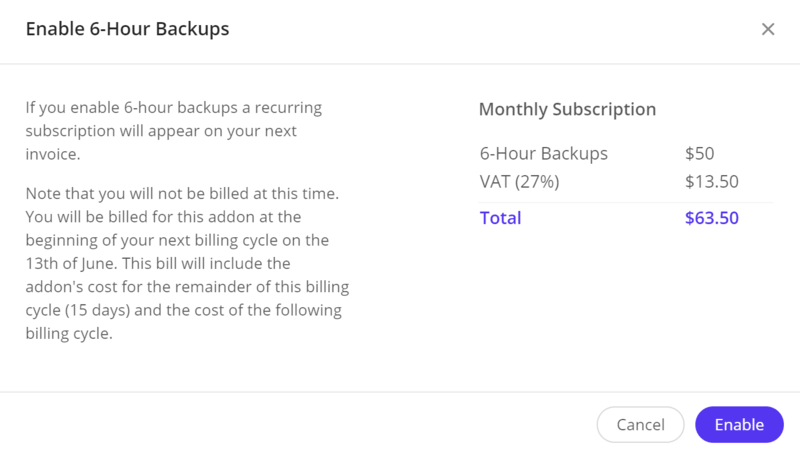 These backups, along with your manual backups, are available as restore points on the MyKinsta dashboard. 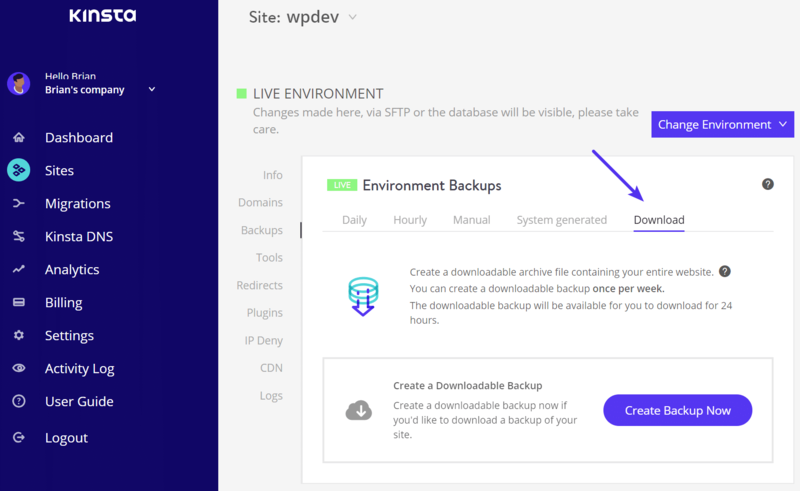 Follow the steps below on how to create a WordPress backup. 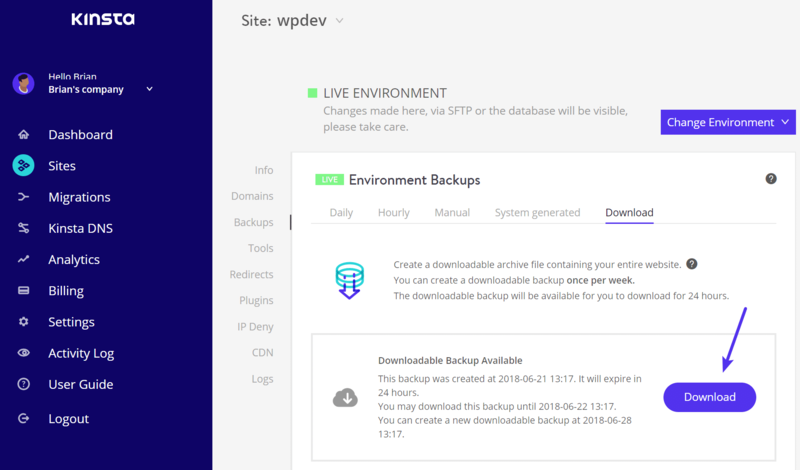 Each backup is a complete snapshot of this environment’s files, database, redirects, and Nginx configuration at the time the backup was created. When you restore a backup all changes to the websites files, database, redirects, and Nginx configuration will be rolled back to the time the backup was created. 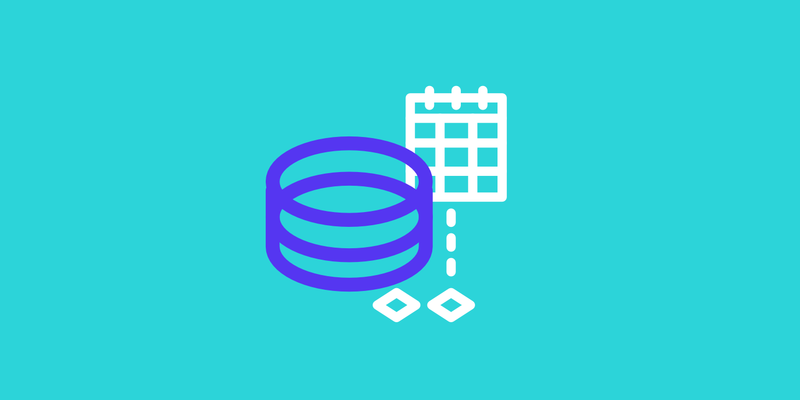 Daily: We create a backup automatically every day which are stored for 14 days. Manual: You can create up to 5 manual backups. These are recommended when you’re rolling out a change on your live site which perhaps couldn’t be tested on staging. Each manual backup is stored for 14 days and you can see the expiry time attached to each. System generated: We create an automatic system backup at certain events (for example, when you restore a backup a system backup is automatically generated). Each system generated backup is stored for 14 days. Within backups, click on the “Manual” tab and click on “Backup Now” to manually create an additional backup. Depending upon the plan you’re on, the number of backups that are accessible might vary (The total amount includes both automatic and manual backups.). Backups will be created every 6 hours and are available for 24 hours. Ideal for websites that change frequently. Backups will be created every hour and are available for 24 hours. Ideal for e-commerce sites, membership sites, and sites that change continuously. To enable one, simply click on the “Choose” button. You will not be billed immediately. You will be billed for the add-on at the beginning of your next billing cycle. That bill will include the add-on’s cost for the remainder of your billing cycle and the cost of the following billing cycle. 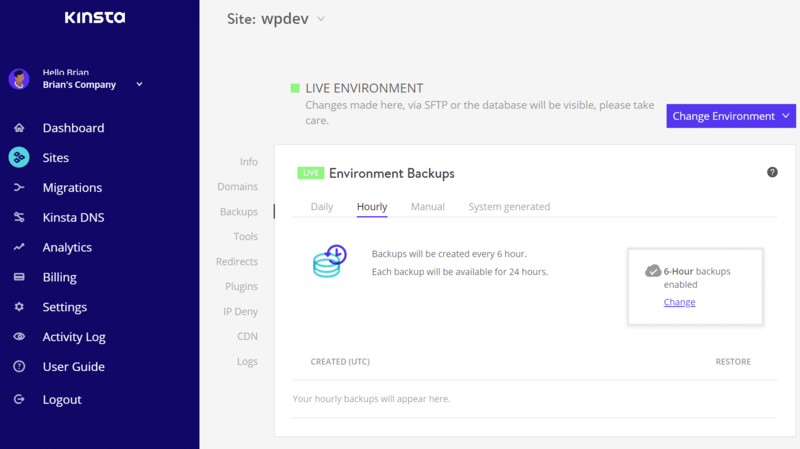 You can view and restore your hourly backups at any time from the “Backups” tab as well as make changes to the add-on (upgrade/downgrade the frequency or cancel). Again, these are additional restore points. When you have the hourly backups add-on enabled, automatic daily backups are still taken and available to restore. You can download an archive file (.zip) containing your entire WordPress site. The archive file contains your website’s files as well as the SQL file containing the contents of your database. You can create a downloadable backup once per week. The downloadable backup will be available for you to download for 24 hours. Click on “Create Backup Now.” Creating the backup may take several minutes depending on the size of your site. You will get an email as soon as the backup is ready for you to download. The backup is a .zip file. It contains all of your website’s files and a mysql-database-backup.sql file. You can restore automatic, manual, and system generated backups. To restore your WordPress site or backup simply click the “Restore” button next to the backup you’d like to restore. Depending on how large your site is this may take a couple of minutes. While the restore is in progress you will not be able to access your site in the admin, we’ll show you a friendly reminder of the restoration process. Once the restore process is complete the admin will refresh automatically and you’ll have access to the site again. Whenever you restore a backup a new backup is generated which will reflect the state of your website just before you restored it. This is handy if you’d like to undo the restore. 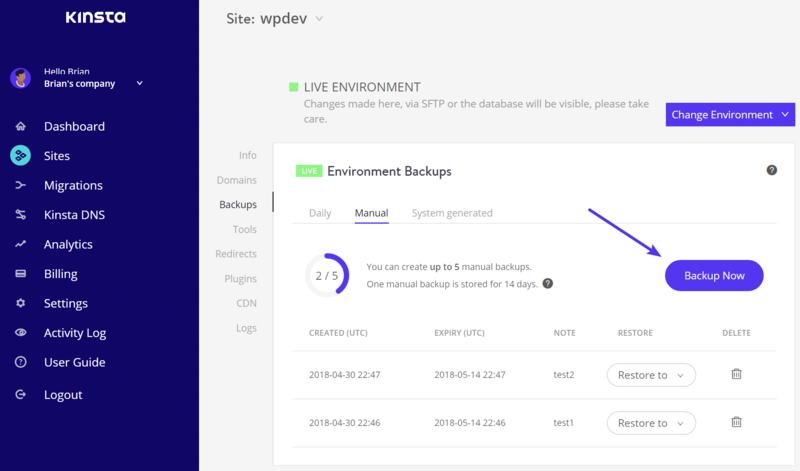 To restore a WordPress backup to staging simply click the “Restore to staging” button. Depending on how large your site is this may take a couple of minutes. You can then access your staging site, which now has its own environment, completely separate from your live production site. 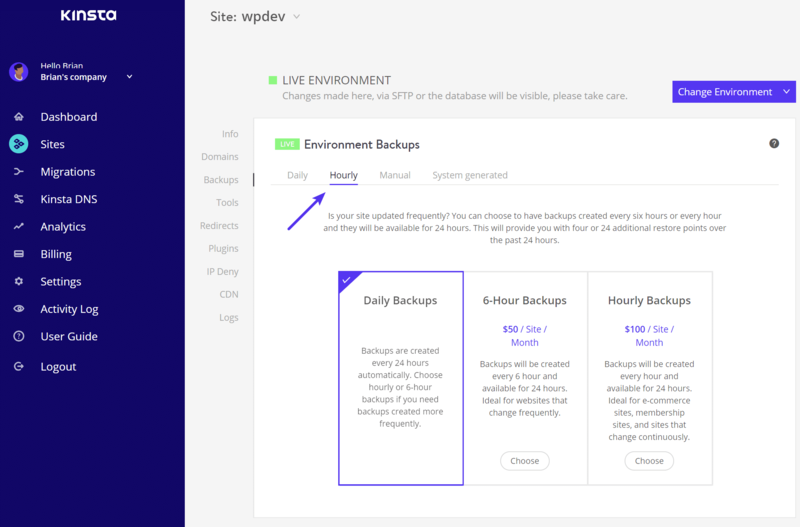 Here are a few additional things to be aware of regarding backups at Kinsta. To give you as much space as possible, backups are excluded from our reporting when calculating your total disk space usage. Your usage consists of only your live site’s files and database.